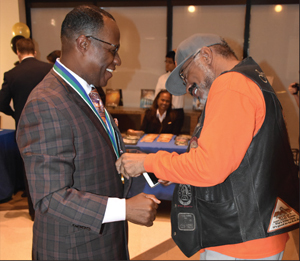 Tony Muhammad, a Nation of Islam student minister and Western Region representative, received the International Association of Scientologists’ (IAS) Freedom Medal of Valor Award at a recent gala for his activism and peacemaking work in the cause of human rights. The gala was held at Saint Hill Manor—home of Scientology founder L. Ron Hubbard, in East Grinstead, Southern England, on October 6. 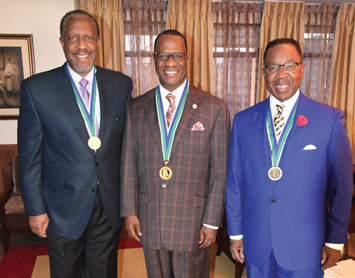 “I am truly honored and grateful to receive this most noble recognition, the Freedom Medal. For now, we have come together. We are allies, now, and partners. This world will never be the same again. I promise you in the name of God,” said Min. Muhammad, during his acceptance speech. Min. Muhammad said his proudest moments at the gala was witnessing 10,000 people leap to their feet just at the mention of Min. Farrakhan’s name. “They just weren’t from London, but they were from all parts of the world, listening, and it was being reinterpreted back to them in their languages,” he stated. Over the years, Min. Muhammad has been a shining example of the love-driven fearlessness that comes from being a student of Min. Farrakhan. Student Minister Tony Muhammad and Pastor Claude Powell share a laugh before Oct. 20 awards dinner. Working with other community leaders and activists, he has created a Way to Happiness movement that resulted in a reported 40 percent drop in crime. The movement has included 50 rides with motorcycles, low riders, sports cars, and mini bikes, through 33 of the toughest neighborhoods in the inner cities of Los Angeles, dubbed the gang capital of the world. Unafraid to go into the trenches to help bring healing to people who suffer daily in such a formidable city, Min. Muhammad has utilized Min. Farrakhan’s guidance to mediate a ceasefire among the rival Bloods and Crips gangs. He thanked the street gangs in Southern California for trusting in him and helping, because without them, none of what he’s done could have happened, he said. “I love South Central Los Angeles, and I will never turn my back on the streets of Los Angeles. And I hope and pray that my receiving this medal on your behalf don’t cause you to become distant, but get closer,” Min. Muhammad stated, during another function, an awards dinner held Oct. 20 at the Scientology Vermont Community Center. He thanked his wife L’tonya Muhammad, for standing by him in his work, Rev. Alfreddie Johnson, Jim and Fumay Mathers, Street Heat bikers club that taught him how to ride a motorcycle, and Pastor Claude Powell. He also thanked those at the Celebrity Centre International in Los Angeles who work with him, and turned the spotlight on fellow community leaders with the United Hood Nation, showering them with love and thanks. The coalition of clergy, gang members, gang interventionists, activists, families of murder victims and community-based organizations have been instrumental in the Peace Rides, and work towards solutions to gun violence, job opportunities, safe housing, and education. During the gala in London, one country asked if the Peace Rides would come and help them to help resolve the gang problems there. “We’ll travel all over this planet to establish peace,” Min. Muhammad replied.